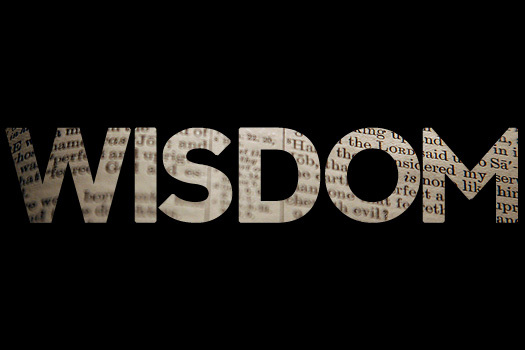 The dictionary defines wisdom as a deep understanding and realization of people, things, events or situations, resulting in the ability to apply perceptions, judgements and actions in keeping with this understanding. This often requires control of emotional reactions so that universal principles, reason and knowledge prevail to determine one’s actions. Wisdom is also the comprehension of what is true coupled with optimum judgement as to action. The ancient Greeks considered wisdom to be an important virtue ,it was something which was sought after by many in the ancient days.In the old testaments we read about Solomon who asked for wisdom to rule. 1 Kings 4 of all thing in this world what do want, Solomon said “wisdom.” Greek philosophers Plato and Aristotle wrote alot on wisdom.Even the word philosophy is a combination of two Greek words; Phi lo – “Love” Sophia – “Wisdom”.This means morality and wisdom go hand in hand .A wise and good life is a moral life.The book of proverbs also speaks alot on it; Proverbs 8:11 “For wisdom is better than jewels; and all desirable things cannot compare with her. Proverbs 16:16, “How much better it is to get wisdom than gold! And to get understanding is to be chosen above .. Wisdom is very important within Christianity. Jesus emphasized it. Paul in the book of Corinthians also speaks of it. Interestingly in 1cor1:20-25 Paul makes a striking difference between Godly wisdom and worldly wisdom.There is actually two kinds of wisdom.There is a wisdom of the world and there is a wisdom of God through Christ by the spirit.Paul made this very clear.The wisdom of the world is very important but limited.It is limited to knowing God.We can never truly know God through the worldly wisdom.Jesus Christ is described as the wisdom of God.This means the wisdom of those perishing can never bring them to Christ.God himself said he would destroy that wisdom. One can never know God through human wisdom.it is impossible. The gospel preached is foolishness to unbelievers who try to understand the gospel by their human wisdom.Paul in the verse 22 makes mention of two groups of people who apply worldly wisdom in their dealings.The Jews and the Greeks. The Jews demand miraculous signs and the Greeks look for wisdom.By this we can deduce that the two categories of worldly wisdom are as follows. 1. THOSE WHO LOOK FOR SIGNS/PROVES;These are those who look for signs from heaven to prove whether the gospel which is preached is true.This particular group can only be convinced by miraculous signs. 2. DOGMATIC WISDOM;The second group of people are those who only believe in what agrees with their doctrine or believe system.They in-turn see the gospel as foolish because it does not agree with their belief systems. Human wisdom says seeing is believing.You must see before you can believe.These are the people who look for signs and miracles.People even see science as a religion because there are able to prove and to understand what goes on around them using scientific methods and approach.They do not see the need to commit to that which they can not prove to be true or see.Others also create idols to worship because they are able to see it.These are all produces of worldly wisdom.The wisdom of God is only made known through his spirit. 1cor 2:11 says ;For who among men knows the thoughts of a man except the man’s spirit within him. ?In the same Way,no one knows the thoughts of God except the spirit if God.The spirit searches all things including the secrets of God.Through the spirit of God we are able to fully fathom what God has freely given us.People without the spirit of God can not understand the truths of God.But we who have the spirit can make judgments about all things. Previous articleGOD’S ATTITUDE TOWARDS SIN.